This is 700 mm, I finished at 480 mm about 2 minutes later. The female we call Red popped into the view again and gets more curious. 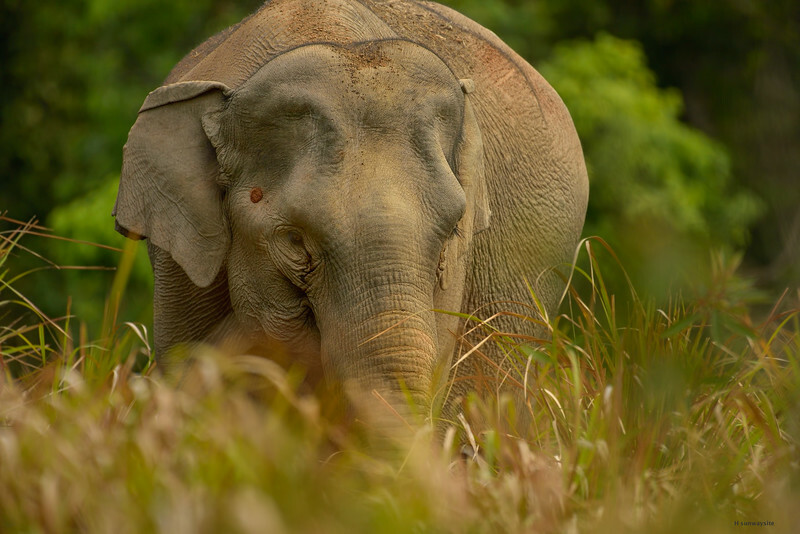 A young elephant senses the atmosphere and looks for reassurance. The last image at 700mm, though the shutter was pressed two more times at this position. She turns towards us again consulting her elephant wisdom and instincts. We were doing about the same. She stopped, making sure we see her well. I composed for a tight full body portrait at 550 and 480 mm. Despite what you see, she is not eating but twirling the grass round and round. 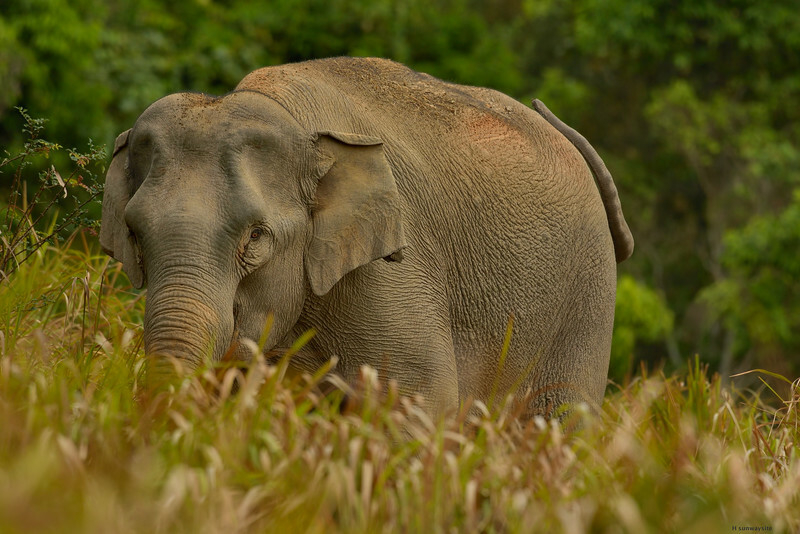 This is elephant’s equivalent to scratching our head. Lighting is still diffuse, slightly harsher in this shot, the sun is rising higher. She is closer but slowly she relaxed. 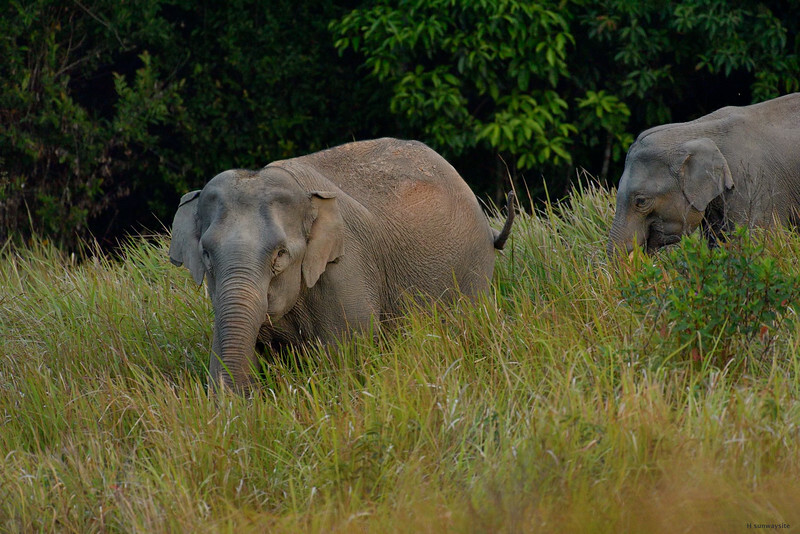 It is more apparent in the last two exposures that followed when she is reaching with her trunk into the grass around. Not pushing our luck any further we started to be putting more the distance from her. Half an hour earlier. Scenario where a faster lens/set-up is useful. DOF has increased (@700 mm) in this shot. A faster lens can isolate even here creating a special photo while lowering the ISO. On the other hand, it never was all about the shallow DOF in photography and more DOF in a photograph like here, or by using smaller formats like APS-C and MFT is just another way of working the exposure. 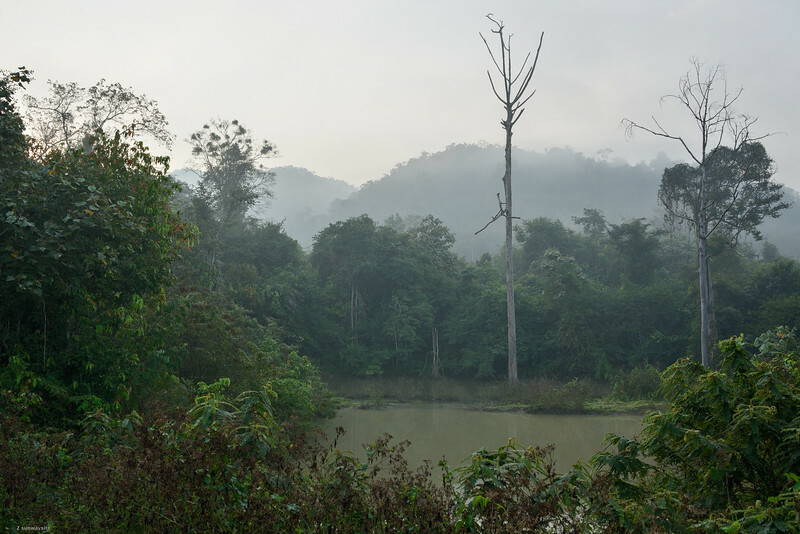 This is 11 minutes after sunrise as the elephants are coming out of the jungle. Red comes first, although we think she is not the matriarch, followed by her young son. The whole group moved further to the left along the gully as they continued their night time grazing and then to our side of the slope. 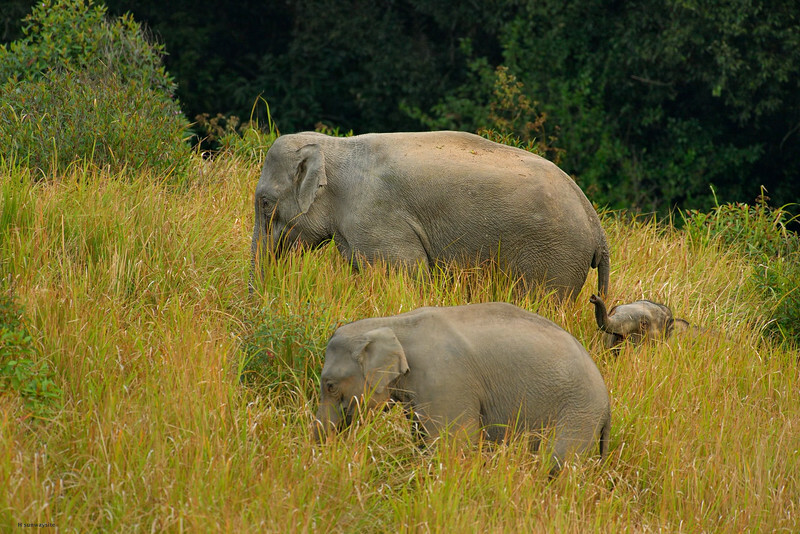 This region is relatively rich for grasslands where elephants can graze apart from spending a lot of time in the forest. 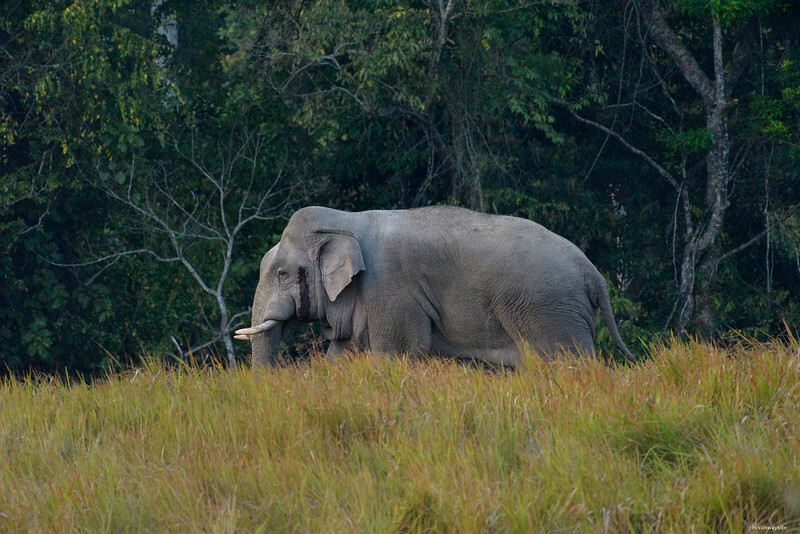 For most wild elephants the space is now limited to the last vast expanses of primary rainforests with sporadic grasslands available (one of the next images is from this location). Some other populations, arguably the majority of today’s populations in Asia, don’t have this left and come regularly in conflict with people living off their lands as the crises culminates for both sides. The following shot is shot about 3 sec. later. It shows Red spotting us for the first time. She was most concerned of the group from the start. Perhaps because her son (a big boy already) sought her comfort often. The young calves didn’t pay attention to us. 650 mm but cropped a touch over APS-C equivalent. The sun obscured by the clouds. They got together for a moment at the lowest point of the gully. Hard to tell exactly whether by a chance or whether our presence had influenced it. The safest place for the calf. Focus is on the female on the right side. 370 mm. Camera metered slightly higer for this and the next shot - (auto) ISO 3600 and 3200 - than I expected but the luck held and the exposures turned out excellent. At 700 mm. 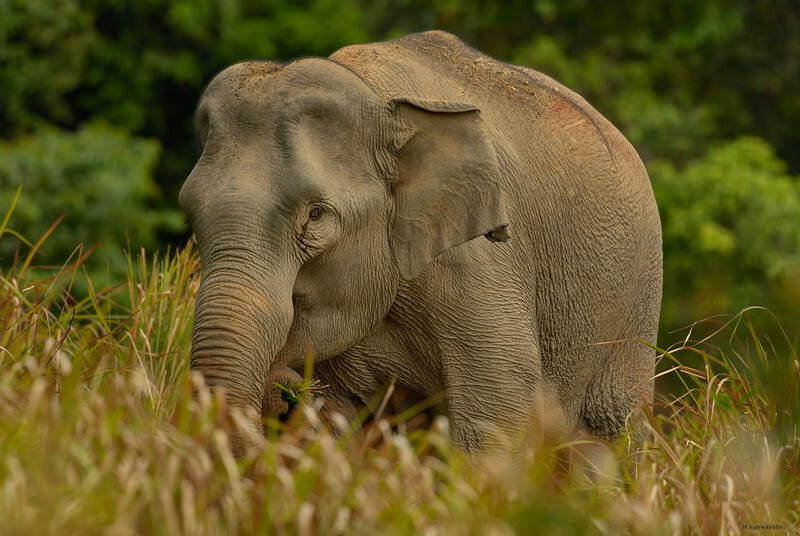 A rare sight: Asian elephant in a pristine environment. The younger of two calves that were suckling. The last shot before the elephants surprise (?) visit. I feel compelled to mention that one keeps safe distance from a bull in musth and never hangs around a female with a calf without a chance of immediate escape. Not to mention the stress caused to the mother in their continuously shrinking world. We were photographing a Serpent eagle when we heard blowing air through the trunk in a way that indicated displeasure. It was close, the more so that all our focus was on the eagle shot. We looked in other directions before slowly moving towards the sound. A large female mining for minerals from muddy pools next to the water hole gets into our view briefly. 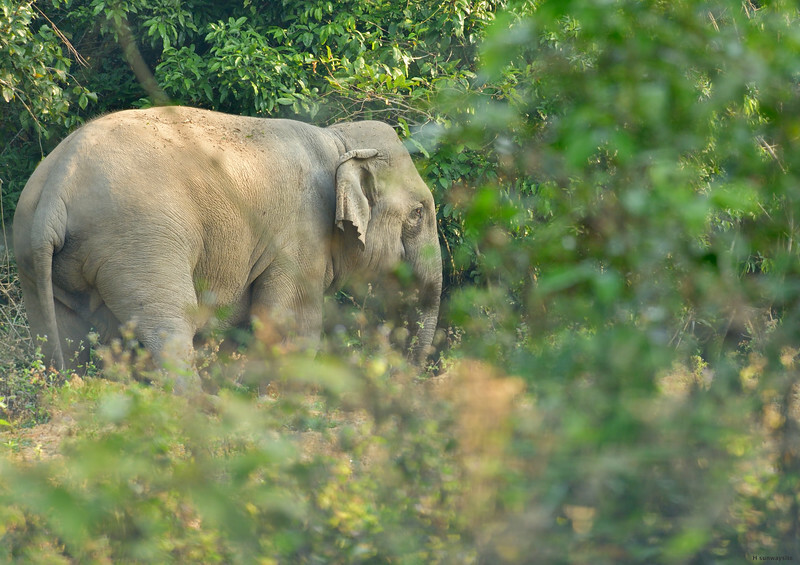 She moves quietly into the forest, probably as the last of a group. When talking to rangers later it turned out that they didn’t recognise this female as known to them. I fired 6 shots as I felt this can be a very brief chance. First a headshot close-up, then 370 mm. We like the last shot. The close-up is good, though. We were still able to return to our eagle that was in no hurry to leave his spot, basking in the morning sun. how to share our world. At dawn, we were roaming over the bush. Hornbills start flying over open spaces shortly after the sun is up. They fly in quite regular routes giving a fair chance to photograph them as they fly by. We kept our eye on them at the spots we knew they are passing. Those who spent some time outdoor know the most memorable encounters in nature come when you don’t expect them. Our attention was refocused quickly onto a group of elephants we noticed were passing along a narrow strip of grassland in the gully below. They were disappearing into the forest soon after. This was no ordinary sight. 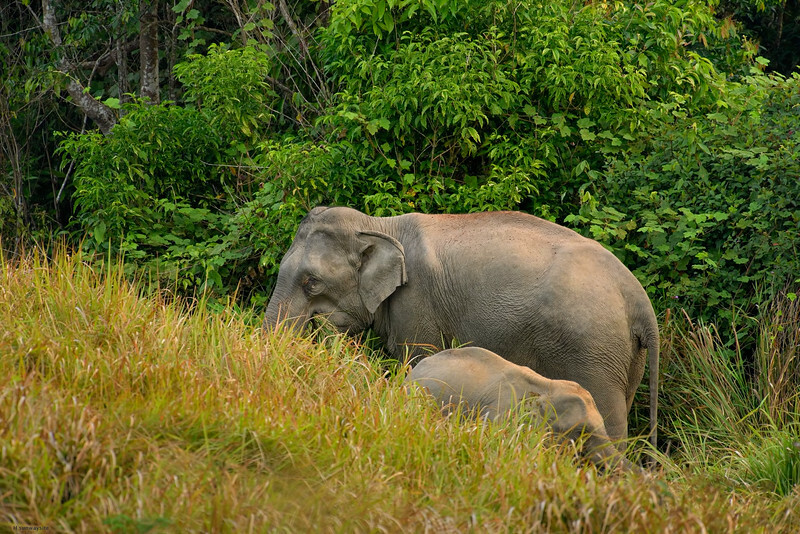 In fact, it is increasingly difficult to get a good view of the elephants in the wild, let alone in the heart of wilderness when most of them spend most of their time in the thicket of the jungle. You can hear the sound of branches being broken and you can glimpse parts of the bodies but you can't get a full view of them. 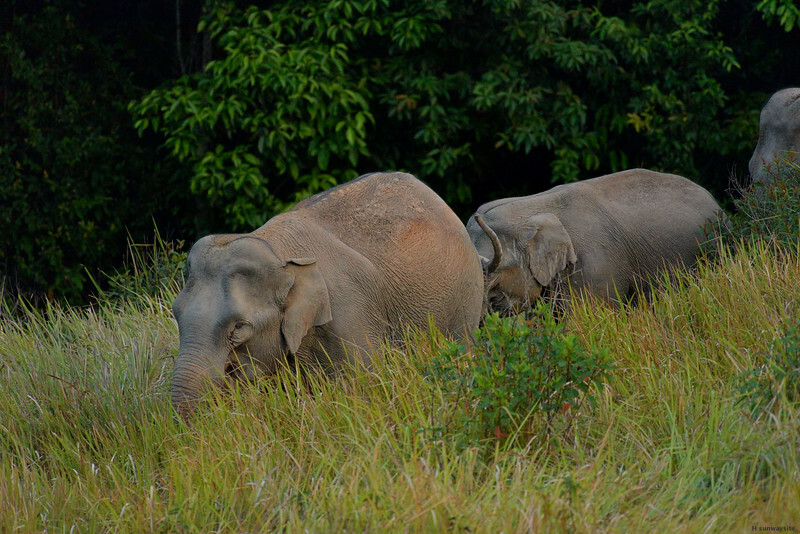 The forest is also a much more dangerous place to meet the elephants. And largely the only places left for them to live relatively undisturbed. We figured that they might reappear about a kilometre further if they were to come out again to the open to graze on grass. They could also cross that open space when heading further. And they could easily turn any direction in the jungle and head elsewhere just as well. But the terrain was promising and the chance decent so we didn’t hesitate and got moving fast to find a suitable spot at which we could position ourselves. As usually, we were carrying our full (photographic) gear. Moving through the thick vegetation comprised of bushes and grasses this tall needs concentration. It’s also morning and the elephants were not the only animals around, we were particularly wary about the prospect of surprising a bull gaur. We could have easily gotten into the range when it reacts instinctively. But making a noise could lower our chances with the elephants, making them fork some other direction. After we got to a higher ground with a view of the gully opening below us, we were waiting at the spot. The problem with waiting at this time isn’t as much the patience itself but the fact that in the morning we only have so much time. A lot can be happening from both worlds now – the animals active during the night ending their activity and for the day time animals the activity peaks in the morning. And that just for the wildlife. For you, it can also be the particular light during that time that makes you if not impatient then selective. The light that morning was pastel soft. As the sun was rising, its rays were diffused and softened by the low clouds above the horizon. We could hardly be bored in this landscape of course, and the hornbills kept our reactions sharp. 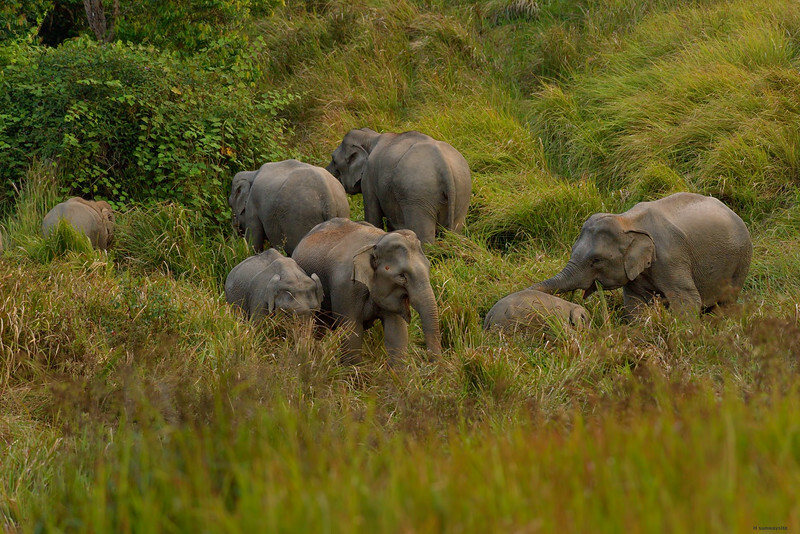 When we were beginning to doubt, to our astonishment, the elephants came out of the jungle right below us about at the lowest point of the gully. They started grazing on the grasses immediately as if nothing and we could see all the individuals in the group, including a calf and a young. They were suckling at intervals, especially the small calf from the matriarch. The calf made us aware of the situation for which we had no plan nor did we actually planned on stalking a group of elephants with calves in the tall grass. The elephants knew of us but seemed relaxed. They were gradually coming closer and higher while grazing as I was shooting and listening to Zlatka’s points and tips about what’s happening outside of the view of my finder. As they were getting higher, we were losing sight of them not knowing what is happening. And eventually, one female checked us out directly when they got to our level. 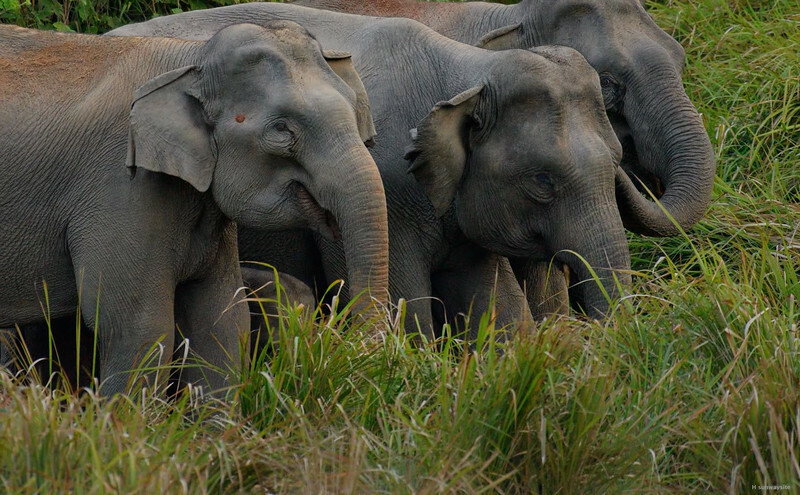 The Asian elephants can be unpredictable towards the people due to many factors and animals from this area have a controversial reputation, to say at least, especially the bulls. This is probably true for most areas today. 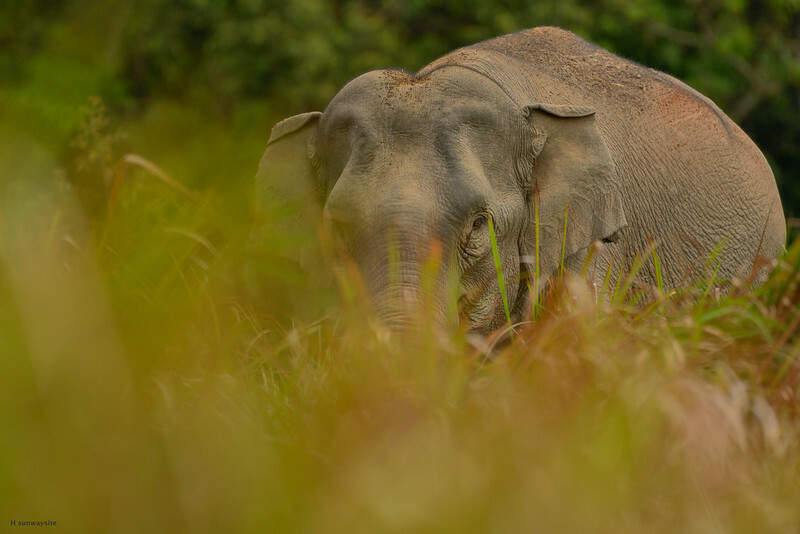 We were lucky to photograph a bull in musth not long after this encounter, too, but that was a far less direct contact and he didn’t pay much attention to us. This situation was different and although we didn’t really stalk them it just happened that we ended up doing something quite similar to it. 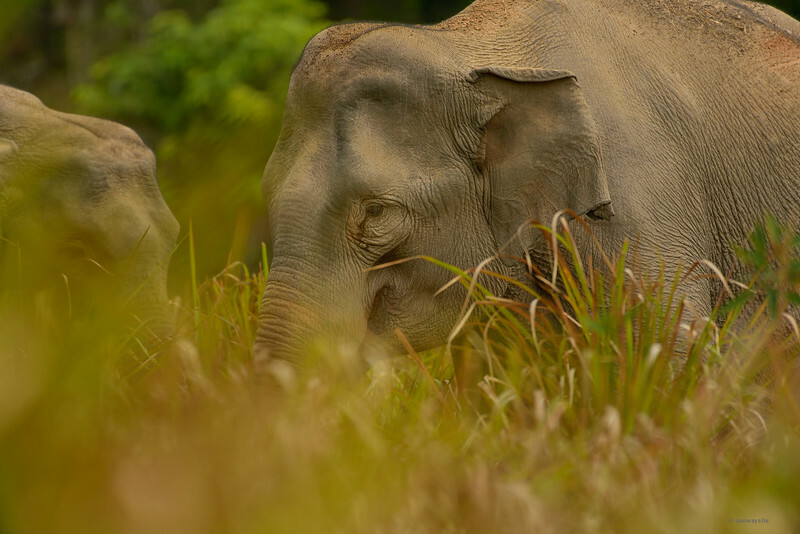 We should find out soon whether the elephants will have the appreciation for the subtlety of the difference, especially if they come close. The clacking sound of the D750 shutter in quiet mode seemed to convey my peaceful message well so far (some birds positively love it) although I was ready to abandon the kit and try to do something ingeniously original (...) should the situation develop into danger. We were only a short time into our journey but it was clear to us that the shots we got were worth the gear or the hassle that could follow, provided we were not harmed. I kept shooting, trying to make the few movements I was doing look as relaxed as I could while watching the closest female for any sign of a shift in her mood through the lens. Eventually, it ended up at 480 mm as I kept zooming out from 700 mm. With the animals this close there was a problem with the elephants I didn’t see. Zlatka wasn’t distracted by looking into the finder but that didn’t calm my nerves as it could be the matriarch who will lose the temper and neither of us saw it. We only heard some sounds of broken branches meaning that some have also gone into the forest on our left which too was close. I kept shooting a few more moments and when I felt I got the close-ups of the female who gave us a few inquisitive looks - a slightly nervous piercing eye maybe - but wasn’t showing signs of being irritated, we started moving backwards slowly. She didn’t keep coming at us and all stayed calm. The fact that it was them who came to us was very helpful, perhaps decisive. They literally found us in the landscape as if we also were just grazing and apparently wanted to get a closer look at us themselves. Somehow, we found our peaceful encounter uplifting in that day. I think I felt like they have every right to run over us a couple of times. I know I was saying something looking into that eye. I am sure I did.